First-round leader Olivia Mehaffey (Arizona State University) eventually slid down to a T15 finish in a field of 93 players at the Darius Rucker Intercollegiate tournament at Long Cove Club, Hilton Head Island. Olivia, from Northern Ireland, had rounds of 66, 79 and 75 for a total of seven-over par 220 over the par 71 course of 6,220yd. 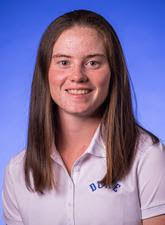 GB and I Curtis Cup team-mate Leona Maguire (Duke), pictured, from Ireland was the top British/Irish finisher with scores of 72, 74 and 72 for 10th place on 218. Twin Lisa Maguire finished T456 on 226 (76-75-76). Maria Fassi (Arkansas) was the individual winner by two strokes with a three-under-par aggregate of 210 (70-71-69). Lauren Stephenson (Alabama) was the runner-up with 69-71-72 for 212. Alabama (866) won the team title ahead of Arkansas (874), Wake Forest (478) and Duke (879).